Is social media changing traditional search engine optimisation? Some argue that search engine optimisation (SEO) is a flawed concept. At its best, it means no more than following best practice in creating clear, accessible websites with intelligible content and meaningful titles. At its worst, it means compromising on engaging content in an effort to perform better within the mysterious algorithms that determine order rankings in Google search. To add insult to injury, a striking post by Dan Graziano reveals that organic results may now only make up 13% of a Google search. 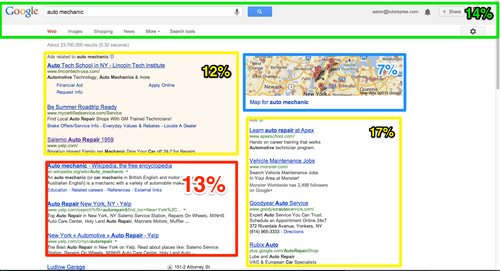 Despite Google achieving search dominance by providing the best organic results, the company has begun to replace organic results with ‘revenue generating Google products.’ Google’s Adwords account for 29% of the page, while a Google Map takes up 7% and the navigation bar occupies 14% of the page (see image below). A Forrester report detailing how consumers found websites in 2012 showed that social media is fast catching up with search. Social accounts for 32% of discoveries versus 54% for search, which is a rise from 25% in 2011. Perhaps a better model for today’s businesses, therefore, is to consider what it means to be social media optimised, with a focus on user interaction. What then is involved in social media optimisation (SMO)? It can involve inviting your audience into a conversation rather than merely broadcasting your own message. It can be listening to social media chatter and acting on what you hear, adding a hashtag or twitter handle to every ad, and ensuring there is a responsive team behind your social media presence for those who do respond. On a more technical note, there’s a whole host of metadata enhancements that can be made to better facilitate social sharing. These metatags are not about keyword stuffing but rather grabbing people’s attention and getting them to click. Facebook, Google+ and Twitter all allow marketers the ability to provide metadata specific to the channel and therein lies an opportunity to provide titles, descriptions and pictures that resonate directly with audiences in a given channel. To bring this discussion full circle, social media optimisation is becoming an important factor in search engine optimisation, with search engines increasingly looking to the recommendations of users of social networks in order to rank pages (see image above). While the efforts involved in SMO are not trivial to implement, they will in fact drive traffic from both direct social site referrals and from search engines, which is an attractive prospect to any marketer.